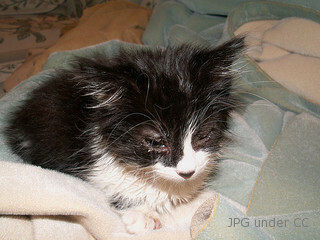 Sometimes our lovely kitty can get a cat conjunctivitis infection (feline conjunctivitis). Like many other ailments and diseases that are out there, cats could get eye infections. If your kitty has been having troubles opening both the eyes, squinting it in a consistent pattern with swelling and a watery discharge, they are most likely suffering from the conjunctivitis infection, and you need to get it checked as soon as possible. Cats can get this ailment from time to time, and it could be something pretty normal, and out of the blue but at other times, but you need to pay careful attention at the duration to which the problem has been going on and occurring. If your car gets fine in a few days, then you probably don’t have anything to worry about but if the problem is severe you would want to get it checked with the vet. The symptoms of cat pink eye are going to be pretty similar like the human ones, but there would be a few differences at some points. The lining membrane of the eye is going to be swollen or turned red with the infection causing a watery discharge to appear in the corners of the eye. You can tell that the cornea of the eye which is usually a clear dome tends to get cloudy and rather opaque in nature. The iris, which is usually colored and rather brighter in appearance, gets duller through which you would know there’s something unusual going on. Cat conjunctivitis infection is characterized by persistent sneezing and upper respiratory tract infections that are very common in cats, as well. The signs of the infection might be present in one eye or it could affect both, as well. To treat the cat eye conjunctivitis, there are many treatments available that you may find beneficial and effective. Antibiotics (like Chlortetracycline) work well on almost all types of these infections, but many holistic pet holders find it constructive to have homeopathic and herbal medications involved in the healing process, as well. This ailment is usually caused due to a weaker immune response of the body which is why these medications tend to boost up the metabolism causing the defense against diseases getting better and better. Natural and medicinal supplements could prove out to be of additional help and assistance in a long run, as well. Hope this guide helps you to treat cat conjunctivitis infection in your lovely pet.